Proceeding up a long avenue flanked with pine trees, The Hermitage historic house is reached. This house is of the type so familiar in the days of the Colonial period up to just before the Civil War as a residence of the well-to-do. In these houses the owners of broad acres lived a life of dignified ease and luxury surrounded by large families, supplemented by numbers of guests. Surrounding the house are grouped the slaves quarters and other dependent buildings, while at one side is a beautiful old-fashioned garden, full of carefully tended plants and shrubs. 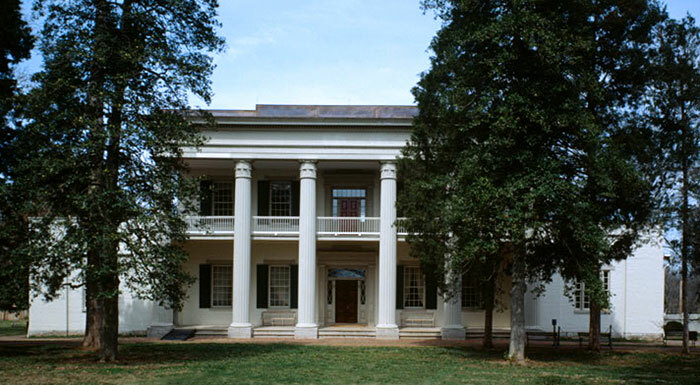 Located outside of downtown Nashville, Tennessee, this plantation was the home of President Andrew Jackson.